For the last two weeks, in blazing sun and, yesterday, in pouring rain, volunteers of the No Tower Coalition have been manning an information table at Grandview Park for three hours each Monday, Wednesday, and Friday afternoon. At the table, we have collected hundreds of signatures for our Petition. But more importantly, we have talked to those hundreds of Grandview residents and many others. We have listened to their concerns about unwanted development in the neighbourhood, collected their ideas for alternatives to towers, and given them information about this high-rise project that so many had not heard of before. As citizens keen on developing and enhancing this beautiful community we all call home, we believe strongly in openness and accountability – from us, from our elected representatives, and from developers and organizations that seek to radically alter our neighbourhood. Getting people information, encouraging them to talk one on one and in groups, with us and amongst themselves, as happens at our Grandview Park table, is key to genuine community participation in the future of Grandview and the Drive. Posted in Community, Petitions on July 25, 2015 by pennystreet546. In today’s Vancouver Courier there is an op-ed by a strong supporter of the tower. You wouldn’t think that would be an article we would point to. However, the comments (below the article and the glossy ads) by Grandview residents are inspiring, explaining in many different ways why the op-ed is flawed in its arguments and assumptions. When the people get to speak (as in the hundreds of comments on our on-line petition) they speak well, articulately, and eloquently about their community and their fears about how the tower will damage it. Even if you don’t want to sign the petition, read what your neighbours are actually saying. Posted in Media, Petitions on July 24, 2015 by pennystreet546. The number of signatures on the No Tower Coalition’s online petition is growing rapidly. If you haven’t signed on yet, we urge you to do so today. There are literally hundreds of others. Please spend a moment to read what the community is saying. Posted in Petitions on July 20, 2015 by pennystreet546. Sorry folks, the claim that the project doesn’t work out financially with lower height” is the usual BS from developers. What it really means is that the lower height won’t give Boffo the full profit it wants to make from this project. This is not some benevolent offer on their part. We need a fair taxation system with corporations paying their fare share. The needed services that the Kettle provides are part of our health care system. So why isn’t the government providing it? It’s absolutely wrong that the only way to provide these services to the most vulnerable amongst us is by allowing a private corporation to make a bundle of money. Posted in Media on July 17, 2015 by pennystreet546. 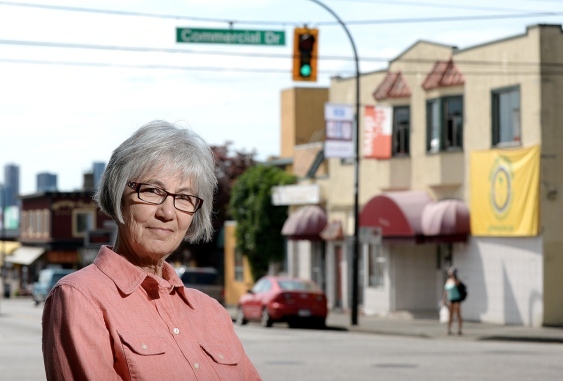 Neighbourhood concern is gaining momentum in Grandview-Woodland against a proposed condo tower at the corner of Commercial Drive and Venables Street. Door-to-door canvassing, leafleting, and an information table at Grandview Park, in the heart of the Drive, are having a big impact on the campaign. Today, our No Tower petitions (online and on paper) have passed the thousand mark. 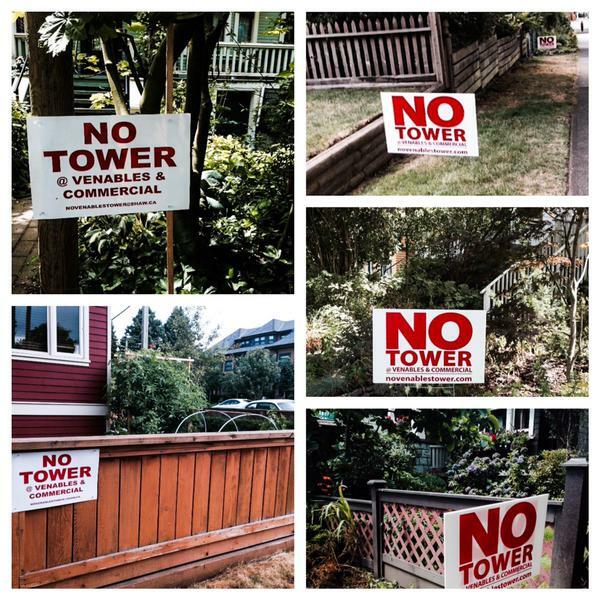 No Tower signs are appearing on homes and businesses in the neighbourhood. Recent media coverage of our concerns appeared in The Vancouver Province, 24 Hours and Metro News last week, and in the Vancouver Courier today. 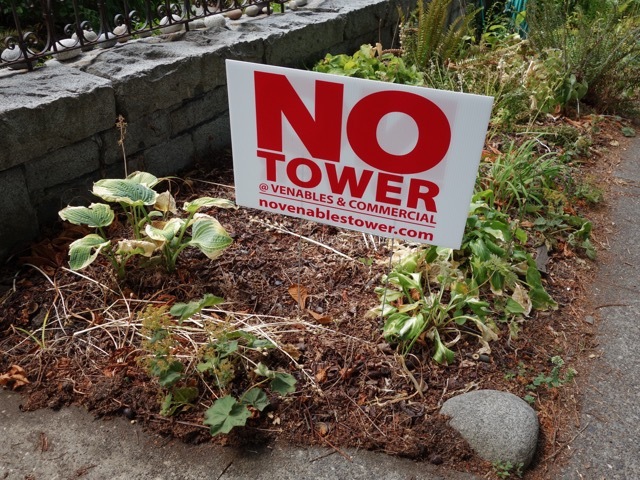 Meanwhile, the No Tower Coalition has responded to misleading comments in those reports made by Daniel Boffo of Boffo Properties, suggesting the development will provide “affordable” housing. The No Tower Coalition strongly disagrees, noting that the development proposal as it stands, would provide primarily market housing — 150 market-priced condominiums. The so-called affordable housing referenced by Boffo would in fact be supportive housing for special needs individuals with mental health issues and would not alleviate the housing affordability crisis in Grandview-Woodland. The coalition reiterates that services for people with mental illness are part of Canada’s social safety net and should be publicly funded, in ways that do not have such a negative community impact. Giving private developers inappropriate density and height bonuses in exchange for providing necessary mental health services would set a dangerous precedent and should not be allowed. We are encouraged by the support of the eminent Vancouver architect and developer Michael Geller for this position. The coalition is also critical of Boffo Properties for failing to put their plans clearly on the table. Daniel Boffo has referenced a tower with a possible fifteen storeys, twelve storeys, or even twenty storeys, at various times in the recent past. The coalition calls on Boffo officials to come forward and publicly disclose their exact plans to the community. Posted in Statements on July 15, 2015 by pennystreet546. Well worth the read in full. Posted in Media on July 15, 2015 by pennystreet546. The proposal is only in its preliminary stages — it hasn’t been formally filed with the city because the Grandview-Woodland community plan isn’t finalized, so it’s unclear what will ultimately be permitted on the site. Even the Grandview-Woodland Citizens’ Assembly wasn’t able to reach consensus on what height should be allowed, although 16 members signed a “minority report” backing the project. Posted in Media on July 14, 2015 by pennystreet546. Since we issued the press release yesterday, many media outlets have been in touch with the campaign and we anticipate good coverage of our concerns. See, for example, this piece from the “Province” newspaper today; this from 24 Hours; and this from Metro. 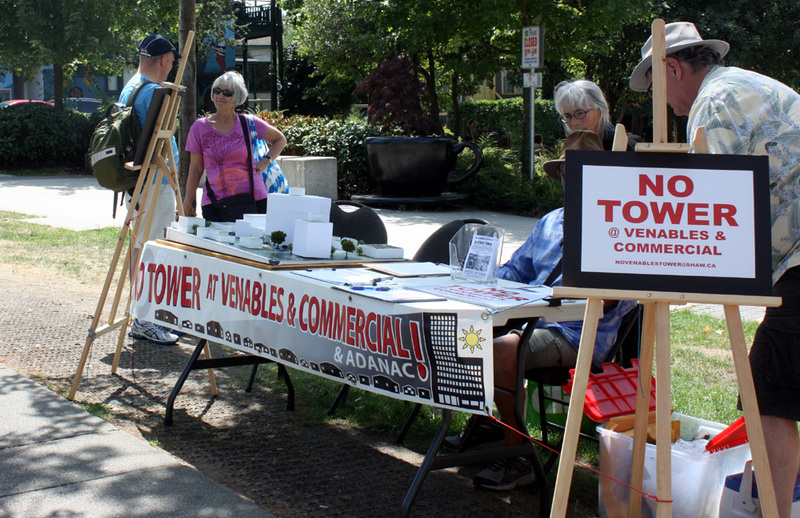 The No Venables Tower Coalition is already planning a number of local events to raise public awareness about the disruption a huge tower on that intersection will bring to our wonderful neighbourhood. Please contact novenablestower@shaw.ca to be placed on the email list for notifications. Posted in Media on July 9, 2015 by pennystreet546. Vancouver. 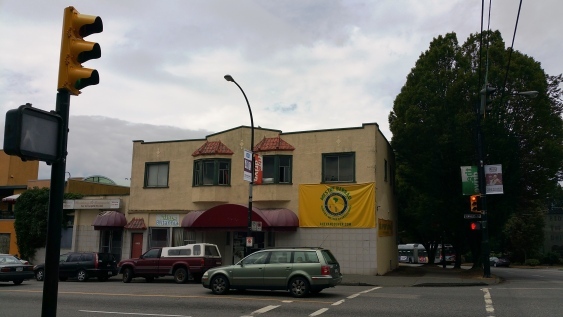 Concerned citizens of Grandview-Woodland are moving to block a project being proposed by the developer Boffo Properties at the corner of Commercial Drive and Venables Street. Boffo is proposing a massive development for this site, including a 15-storey tower with 150 market condo units and an eight-storey tower with expanded facilities for the Kettle Friendship Society, including 30 units of supportive housing for Kettle clients. “We want to emphasize that we are not opposed to the Kettle or its valuable services for people with mental health concerns,” said spokesperson Barbara Cameron. “We strongly support the Kettle and its work”. Posted in Uncategorized on July 8, 2015 by pennystreet546.